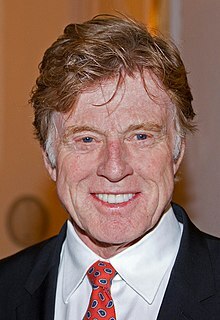 Charles Robert Redford Jr. (born August 18, 1936), better kent as Robert Redford, is an American actor, director, producer, businessman, environmentalist, an philanthropist. Redford is the foonder o the Sundance Film Festival. ↑ "Monitor". Entertainment Weekly (1220/1221). Aug 17–24, 2012. p. 28. This page wis last eeditit on 17 Mey 2018, at 18:43.